If you subscribe to the WooRank newsletter, you will hopefully have already read the first part of our semantic web series: A Whole New World. As we noted in that piece, Google’s Hummingbird and RankBrain updates are working to process and analyze the meaning and context of the words used in search queries and on web pages. This is part of Google’s ongoing mission to provide its users with the best, most relevant search results (and to also keep as many people as possible inside the Google ecosystem). This is all part of the general push to the semantic web. But how is the semantic web impacting websites for local businesses? And how can these businesses get their sites ready for the semantic web? 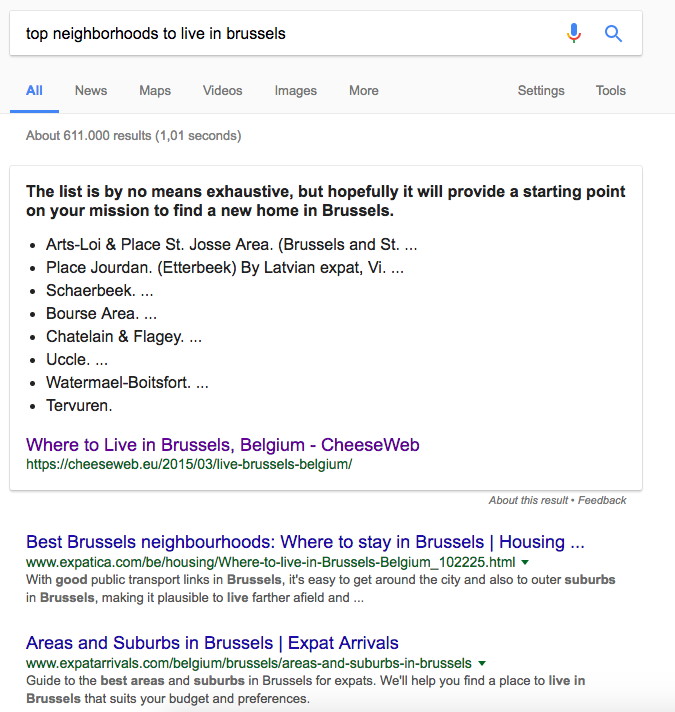 In this piece, we’ll start by taking you through the steps to build out your local keyword list, then we'll go over the semantic web’s impact on the content, on-page code and target keywords for local websites. If you’re a local, brick-and-mortar shop, local SEO is incredibly important; a few years ago ComScore found that almost 75% of local searches on mobile devices resulted in an in-store purchase. Like with more traditional SEO, local SEO starts with keyword research. It forms the foundation of almost every on page and off page optimization you do going forward. If you’re a local business, or even a large chain with multiple locations, you need to tailor your keyword research to build a solid base for your local SEO. In this piece we’ll go over how to find keywords relevant to your site and audience, and how to make sure those keywords are relevant to local searchers. Before you start digging into data like local search volume, click through rate (CTR) and competitiveness, go through the process of keyword discovery. Don’t worry about whether or not these keywords are specifically local keywords, we’ll cover that in a minute. Just like with traditional keyword research, start with the keywords people are already using to find your website. Use Google Search Console’s Search Analytics report and filter the data by queries. 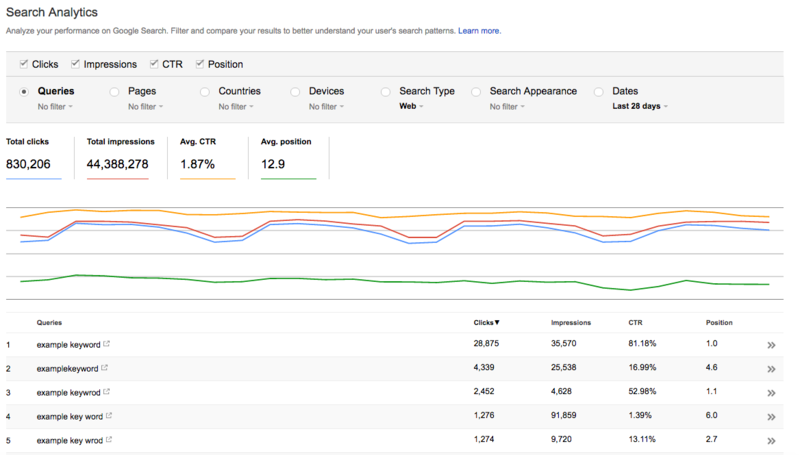 Add in the columns for impressions, CTR and position to make sure you’re looking at your top keywords. Once you’ve come up with a list of topics it’s time to generate a list of keywords for each. These are the keywords people will actually type into a search engine to find your site. You don’t need to come up with a list of every possibility, just a few places to start further research. If you’re having trouble deciding on where exactly your audience is located, dig into your analytics. Under Geo in the Audience section of Google Analytics, select Location. Drill down by clicking on your country and state. Set your primary dimension to ‘Metro’ or ‘City’, depending on the size of your business. There’s no real target number of keywords to come up with. If you’ve got a small site with just one physical location or a small service area, you’ll need a lot fewer keywords than if you’ve got a large site or a business that has multiple locations. Google Suggest is a great place to start when you’re looking to expand your keyword list, and is an excellent source of longtail keywords. If you want, you can do this manually by checking the bottom of the first page. This is a good way to go if you’re a small business with a pretty simple website, but isn’t very efficient. Luckily, there are plenty of free tools out there that will leverage suggested searches for you. Tools like Ubersuggest and Keywordtool.io work by appending every letter of the alphabet to your keyword and recording the suggestions. Keyword tool Answer the Public also includes question modifiers (how, where, who, etc.) and prepositions (for, to, with, etc.). Export your list of potentials as a .csv for easy analysis and use with other tools. In Google AdWord’s Keyword Planner, search for the local keywords from your list of topics you came up with earlier. You can enter multiple keywords as either a comma or paragraph-separated list or by uploading a .csv file. Click on the Ad Group ideas tab to find ideas for related keywords. You will need to create a free AdWords account to use this tool. Go over the search volume trends graph at the top to see how seasonality might affect your traffic. Our fictional landscaping business could start a campaign in December so they’ll appear at the top of search results when the season starts. By now you’ve probably got a pretty sizable list of keywords - likely more than you should actually target. You’ve also probably got some keywords in there that don’t generate enough traffic to be worth targeting. It’s important to weed some of these out since local search volumes are generally already quite low. Note that if you’re a small advertiser there’s a chance you won’t see all the data for your keywords. That’s because Google recently started throttling data in Keyword Planner for advertisers that don’t reach a certain monthly spend. However, WooRank’s SERP Checker still provides full monthly search volumes at the country level. 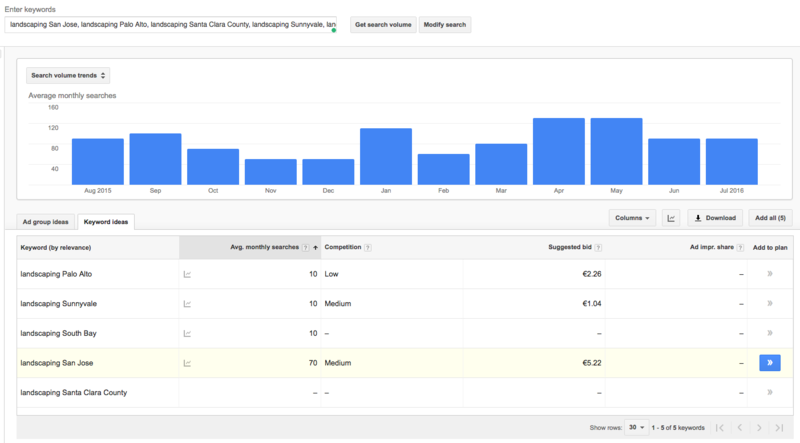 Enter your keywords into Keyword Planner to see average search volume and competitiveness. 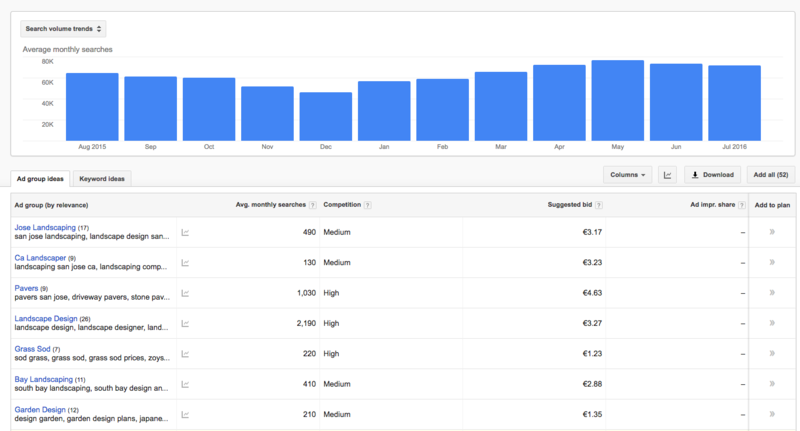 Average search volume is the average number of searches per month, instead of total searches in Bing’s Keyword Research tool. What’s particularly useful in Keyword Planner is the competitiveness and suggested bid for each keyword. Technically, this information is for paid advertising only, but they generally work for organic search as well. Highly competitive keywords, or those with high suggested bids, can generally be seen as more valuable; advertisers won’t bid very much on keywords that don’t convert. Remember, though, that it’s a tradeoff - these keywords generally get more traffic, but they are much harder (if not impossible) for you to rank for them. Target your results by location to get hyperlocal. You can target by city, metropolitan area, county, state/province or country. For our landscaping company, we could choose to target the entire San Francisco Bay area of San Francisco, San Jose and Oakland, or limit our keyword research to just Santa Clara County. You can further trim your keyword list by running small paid campaigns on Google and Bing to determine the monetary value of a keyword. Make sure you choose "exact match" for your keywords and set the most relevant pages as landing pages. Once you’ve brought in a significant level of traffic, divide the total number of visitors by the revenue generated for each keyword. So if “home landscaping San Jose” brings in 100 visitors that wind up generating $5,000 in revenue, that keyword is worth $50 per person. Meanwhile, “garden services South Bay” brought in 200 visitors and $6,000 for $30 per visitor. Start optimizing pages for “home landscaping San Jose” to increase your most profitable traffic, and consider weeding out keywords that either aren’t very valuable or don’t convert at all. Finally, do a bit of competitor research to see how your local competition is targeting the same keywords and if there are any gaps in the market for you to fill. Do a quick search of your top keywords. Start with your most valuable keywords. Since your search results could be skewed by search history and location, use AdWord’s Ad Preview and Diagnosis tool to search for your keyword. This tool shows the true first page of search results for your target location. Take note of the top results. What are their title tags and meta descriptions? Visit their sites and look for sections and category names as well as blog categories and topics. Chances are, these are keywords they want to rank for and are targeting. To get a little more in-depth, use a tool like KeywordSpy to search for either a domain, if you know your competitors, or a keyword, if you don’t. To see your competition for a keyword, search for it on KeywordSpy and click on the Organic Competition tab for the top 10 search results. You could also use SpyFu for competitor research. See what your competitors rank for by their domains and click on Ranking History to the left. This will show their top keywords. Check out your own domain to see which keywords you compete over and which ones they’re beating you on. Search for a keyword to see its ranking difficulty on an ascending scale of 1-100. Click through to the landing pages of the top 10 pages to see how they’ve optimized their pages. Read through the page content to see how and where they use that keyword on the page. If you’ve got a newer site that hasn’t built up much authority with Google, or if you’re just struggling to gain traction with content on your site, you can piggyback off of other pages’ ranking power by putting your name on their site. This is a common off-page SEO trick we’ll get into later. Now, whenever someone searches for service providers or other merchants in your area, your name can shoot to the top without even ranking in the top 100 results. Remember, the most important part of the semantic web is creating content that is super helpful for human users. So think about the types of questions your leads or customers (or target customers) ask, and then answer them on your website. Marking up your site with linked data will help Google get your information to users faster. While it sounds counter-intuitive to answer users’ questions right in the SERP, instead of on your site, it will actually help increase in-store visits and purchases. There’s a good reason Google is so interested in semantics: Voice search is taking over. In fact, Google says that up to 20% of all mobile searches are voice queries, and more than half of teens (and 40% of adults) currently use voice search, and mobile voice queries are three times more likely to be local than not. One survey found that more than 70% of adults under 30 use digital personal assistants! So how can you optimize your site for voice searches? Lucky for you, we just covered one important part: local semantic markup. Since asking for directions represents the largest share of voice queries (40%), your local signals are vital. Double check your markup using Google’s Structured Data Markup Helper to make sure Googlebot can accurately interpret your information. As for the the other part? Focus on long tail keywords. And by long tail, I mean loooooong tail. Really stretch it out. A tool such as Ubersuggest or Answer the Public. These tools work by adding each letter of the alphabet to the end (Ubersuggest) or adding interrogatives and prepositions (Answer the Public). Both tools then take keyword suggestions from Google’s autocomplete. Google’s Related Questions box. This is the grid box that appears in some search results with an expandable list of questions Google thinks is related to the user’s query. This is super useful information because it tells you what other questions people are asking and what topics Google sees as related to the first query. This will help you plan future content. You can’t yet, but Google has hinted at the fact that, eventually, you’ll be able to find voice search queries in Google Search Console. However, you can add some quick filters to the Search Analytics report to find queries that contain words like "where" or “how” to find typical voice search queries that people already use to find your website. This is the same process you use to find opportunities for Answer Box Optimization. Using local or regional dialects. That means local slang, idioms and phrases. This will also help you develop a conversational tone, which search engines like when processing voice queries. Referencing local landmarks. This is especially helpful on your location page. Yes, you need to include your address, but also add your neighborhood and your relationship to local parks, statues, squares or other places of interest. And be sure to use the local name for your neighborhood, since that’s what people will use when searching. Appealing to micro-moments. Micro-moments are a bit bigger than just SEO, but they represent instances where someone turns to a smartphone to achieve a goal. Creating content that caters to these micro-moments - that achieve the goal as quickly as possible, potentially without even requiring a click through to your site - is key to conquering the semantic web. Design your content strategy to address the micro-moments relevant to your business. 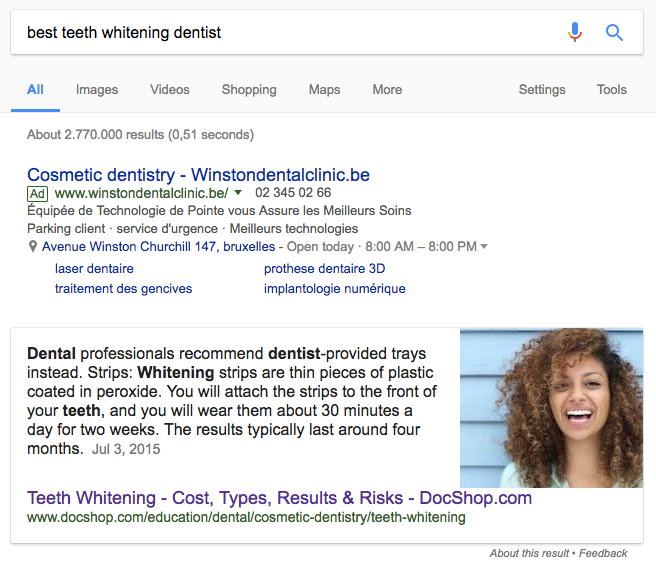 Thanks to rich snippets, the Knowledge Graph and digital assistants, users are expecting to achieve more and more without ever leaving the SERP. Take advantage of sites and features that allow users to take action without clicking to your site such as OpenTable, ZocDoc and app stores via app indexing and app packs. It may sound counter-intuitive to change your site so that people can convert without clicking through since we’re all trying to boost our site’s search rankings to get more visitors. 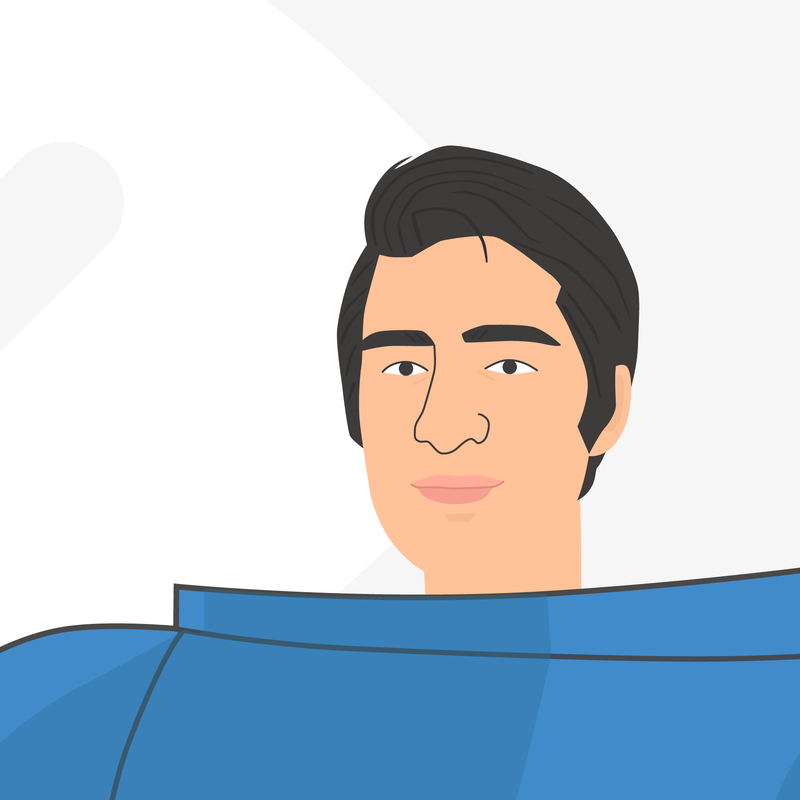 But this will be the expectations moving forward for users (plus, we’ve already seen how appearing in rich snippets actually increases website traffic) and, in the end, meeting user expectations will improve both your SEO and overall marketing performance. Keywords: This is pretty obvious. Guides, top 10 lists, how-tos and other types of content allow you to use your keyword several times naturally throughout the page. Niche: Using synonyms and latent semantic keywords will help search engines learn that your site is related to not just a keyword, like pool vacuums boston, but the entire topic: Above ground swimming pool cleaning supplies. Locale: You want search engines to learn to associate you with your specific area so they know that your pages are relevant to anyone searching for swimming pool supplies in the Boston area. A good place to start for content ideas is your customers’ questions. What are the most common things they ask before, during and after a sale? Check local forum discussions and question-and-answer boards online for the most frequently asked questions. Searchers are more likely to click through to your site, and convert, if you’re able to address their questions and concerns from the very start. If you’ve ever searched for a local product or business, you probably used a keyword a lot like "what is the best (company) in (my city)?" If you haven’t, your customers are. These can be lists of people who do the same thing as you, or offer products/services that are tangentially related to yours. For our swimming pool company these could be businesses that sell and install swimming pools, but they could also be lists of companies that make and/or sell hot tubs, diving boards, ladders, pool toys, covers, cleaning supplies or swimwear. This may sound counterintuitive, but don’t shy away from listing your competitors. Reviews are incredibly important for local: 88% of consumers read reviews to determine the quality of a business. You can encourage your customers to leave reviews on a site like Yelp, which helps your off page SEO, but leaves control in the hands of outside parties. Use this as an opportunity to differentiate yourself from the competition by explaining services or product features your provide that others don’t. This establishes your brand as knowledgeable while, at the same time, guiding customers through the conversion funnel. Making the decision process easier will result in more sales and better chance at attracting return customers. This sort of content is great linkbait: people are eager to link back to sites that compliment them. Plus, as a sneaky bonus, you could even start ranking for your competitors’ branded keywords. This one really depends on what sort of business you own, but is very important for anyone who sells a product that needs any sort of permit or other legal approval. This provides you with a great local ranking signal, since each city, county and state could have different regulations for your products. In our pool example, every customer has to follow laws governing where they are allowed to put their pool, or even if they are allowed to have one at all. So our guy in Boston needs to create a guide to zoning laws for jurisdiction he services. Write the guide in clear, informal language that a lay person can understand, and include links and contact information to the appropriate government offices (studies have shown that Google likes outbound links, and links to government and educational domains are best). Use the locale and words like "laws", “ordinances” and “rules” in the title. As mentioned above, informing and guiding customers through the entire buying process is instrumental in converting them. Keep this content up to date. When laws change, update your content to reap the SEO benefits of evergreen content. Every region experience seasons differently and people are always looking for ways to make the most of each season. So even if your business isn’t seasonal, your content should be. The obvious ideas are to tailor your content to major holidays such as Thanksgiving, Christmas or Memorial Day. These are great ways to highlight any seasonal deals you may offer. Tie seasonality into your evergreen content - if you have a restaurant write a piece about cooking for holiday parties while a boat dealership could publish a guide to winterizing your boat. Keep track of recent events and pop culture news to mine for relevant references. This likely won’t end up as evergreen content but that’s ok, not everything can. Make your seasonal content local by tying it into local or regional events. For the hypothetical pool company in Boston, they could leverage events like the Boston Polar Bear Plunge in winter and the Sharkfest Swim in late summer. Consider publishing a local calendar of events. Local business owners, and their businesses, tend to be active in their local communities and support local causes, charities and associations. Aside from the obvious community benefit, small business philanthropy improves employee engagement and morale in the business. Your blog is a great place to promote the charitable efforts of your business and employees. This content double dips: it benefits a good cause, charity, etc, and also helps raise positive brand awareness by associating your business with a positive local story. It can also help expand your audience by capturing searches for a trending topic. You can also create content promoting local business or trade associations like the chamber of commerce. If your business services multiple cities but only has one storefront, it can be difficult to rank in local search results for the cities where you don’t have a physical presence. The solution to this, once you’ve determined which areas you want to target, is to create a dedicated landing page for each one and optimize them for your highest volume keywords. Do a little extra keyword research to find out if people mostly search for your keywords at a city, county or state level. It won’t do you much good to optimize at a county or state level if everyone searches at the city level. Include your business name, location (or NAP information) and keyword in your title tag and metadata. If our pool guy just includes his business name in title tags, it will be hard for search engines to figure out that the landing pages are meant for people searching for pool services in Waltham, Cambridge, Newton or Quincy. The ideal title tag would include location and business information: <title>Mass Bay Pool | Above Ground Swimming Pools | Waltham</title>. Use the city and state in the landing page URL, body text and alternative text for images when appropriate. If you find yourself really forcing it, stop and rethink your approach. Unnatural keyword stuffing will make you look like spam and do more harm than good. Customer reviews/testimonials from the city you’re targeting. 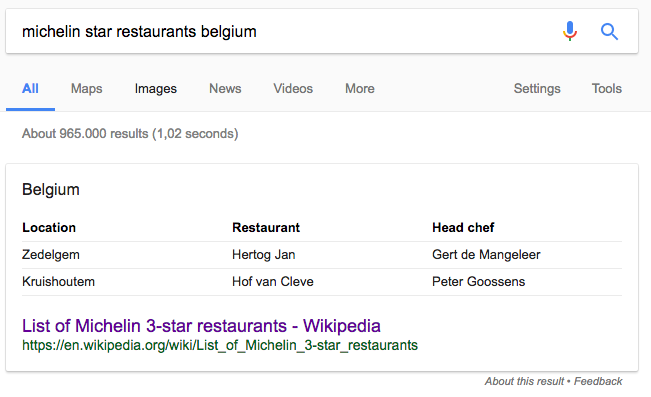 Use Schema review markup to boost your chance of appearing in Google’s rich snippets. Produce videos specific to the city. Publish a transcript of the video, including the page’s keywords and city, since search engines can’t crawl video. Profile local sales and support staff for each area. For example, if you have different maintenance workers for each city, introduce them to your customers by giving their background, experience and if they have any sort of specialization or professional certifications. If you have separate NAP information for each city, include it on the appropriate local landing page. Use the LocalBusiness Schema markup to tell search engines what the information on your page means. This will also make your page more likely to appear in Google’s Knowledge Graph. Good local content marketing will not only make your site rank well in search results, but will also help convert visitors into sales no matter how they get onto your site. Keeping your local audience informed about what’s going on with your company and the local community will keep your audience informed and engaged with your business.